A computationally efficient atmospheric chemical transport model (FRAME) was used to generate source-receptor concentration and deposition data from a variety of spatially distributed and point sources of nitrogen and sulphur emissions. 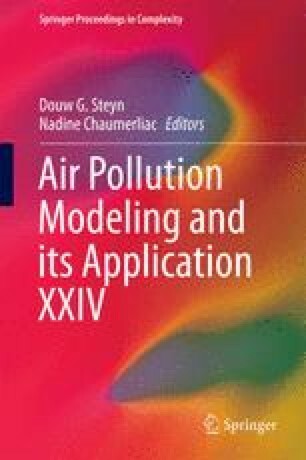 The model was evaluated by comparison with measurements of nitrogen compounds in the gaseous, particulate and aqueous phase and found to be fit for purpose as a policy tool for assessing the effects of future emissions controls. A scenario for the year 2030 predicted that 64 % of the area of natural ecosystems in the UK would be subject to deposition of nitrogen exceeding critical loads. Wouter Lefebvre: Do you take into account compensation points and vd = f(CNH3) relationships? Answer: As the model runs in a fast ‘annual average’ mode, it is not suitable for inclusion of canopy compensation point calculations. The deposition velocity of ammonia is calculated separately to six different surface types (forest, moorland, improved grassland, arable, urban and water) using a canopy resistance formulation with the canopy resistance based on annual average values. Questioner: Have you tested your assumption of linearity? Answer: The change in nitrogen deposition has been tested for different percentage reductions in emissions from a single point source. These revealed a close to linear relationship for smaller emissions changes with some divergence for large percentage emissions reductions (close to 100 %). Source receptor relationships were calculated with a 25 % reductions in emissions for each source to avoid the non-linear chemical perturbation associated with higher percentage emissions changes.